Learn about the HDFC bank RPLR rate! 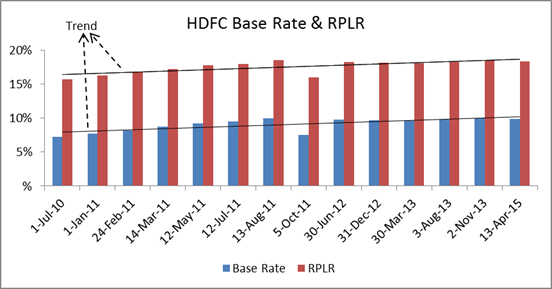 HDFC’s home loan interest rate is dependent and decided based on Retail Prime Lending Rate (RPLR). If the base rate changes due to changes in the interest rates in the economy, your rate will be affected. This base rate typically varies from lender to lender, and so does their nomenclature. HDFC calls it the RPLR — Retail Prime Lending Rate. ICICI Bank uses the term FRR — Floating Rate Reference. HDFC follows a three month reset cycle for its floating rate loans and hence the change in RPLR will impact all the existing customers over the next three month period depending on their date of first disbursement. The maximum period of repayment of a loan shall be up to 30 years for the Telescopic Repayment Option under the Adjustable Rate Home Loan. Through any of its offices across India and abroad, you can purchase properties from their current location. Most PSUs offer interest subsidy facility on loans their employees take from banks or FIs. HDFC considers this interest subsidy as part income and offer high loan amounts to you. Besides the regular EMI scheme, they also have step up, FLIP and other payment plans to help you choose repayment scheme which is just right for you. In case, it can’t accept the funded property as security on the loan, it offers loan against an alternate security. Any other immovable property can be taken as alternate security subject to its legal and technical clearance. HDFC will retain the documents of the property as well as of the collateral security. You can avail of a Home Loan, Home Extension Loan, Home Improvement Loan, Top up loan or Loan against Property subject to total exposure on the property not exceeding the limit ascertained by HDFC from time to time. No additional security required. In subvention schemes, the interest of the home loan is borne by the developer, for a specific period. In Flexi-payment schemes, the developer offers you discount in some form. Door Step assistance is available by sales officers who provide complete information on the products. Complete online access to the home loan, where you can view all the related important information. Developer projects are approved only after the due-diligence by the expert team, so that you can buy a legally sound property. Hence, with the trends of rplr and the advantages you can make a wise decision regarding your home loan. Author keerthiPosted on July 29, 2015 January 1, 2017 Categories HDFC Home Loan, Home LoanTags HDFC Home loans, Prime lending rateLeave a comment on Learn about the HDFC bank RPLR rate!